It’s the gold rush all over again but unlike California 1848, it’s yours for the click of a button, there’s no travel, you’re not risking your life, and the investment is just £0.20 a bet. Wild Falls is a gold rush themed online slot from developers Play’n Go and its one of the first new casino games of 2019 that’s got our attention. Wild Falls is a 5-reel online slot machine from Play’n Go with 20 ways to win and 10 winning symbols. 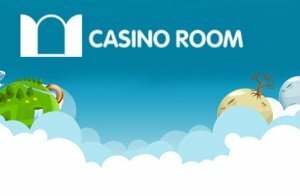 You can play the gold rush theme casino game on mobile, tablet or desktop and bets range from £0.20 to £100 a spin. It’s a high volatility slot so expect the unexpected with lots of rapid change. On the pay table, there’s max win exposure of £1,000,000 and up to 10,000 x stake in the Super River of Gold Feature. The payout rate for the Wild Falls slot is 96.50% RTP. What’s going on in Wild Falls by Play’n Go? Ok, there’s a river, presumably, there is gold beneath the running water and lots of beating the banjo. Starting at £0.20 a bet, Wild Falls is a low-risk way to enter the Gold Rush, that’s if you’re keeping those bets small. It’s highly volatile remember. Play’n Go cleverly place the 5 reels in the waterfall with floating treasure chests that interact with the game. The Banjo can be punishing to the ears, but striking gold is worth the effort, especially as Wild Falls offers unlimited free spins. 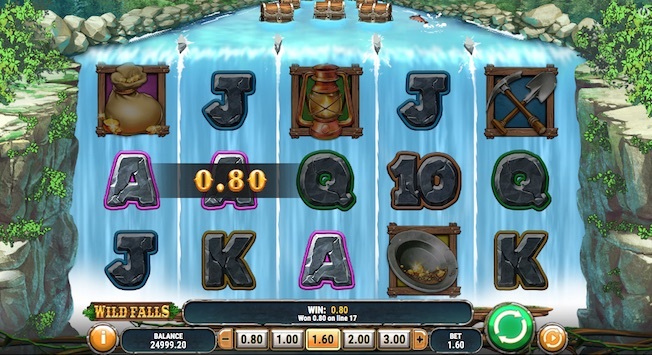 You spin the reels from £0.20 a bet, symbols roll over the water (spin), and treasure chests float downstream. As these chests fall over the waterfall (all chests are wilds and scatters), they can offer random respins, multipliers, a gold rush, river of gold and a super river of gold. Symbols include high-value gold rush useful items such as a lamp, mining equipment, bag of gold and gold panning kit (everything you need when you’re scrounging for gold in the water). Low symbols include our regular card vales 10, J, Q, K and A. As we’ve already said, the chest is the main bonus feature, and that’s what you’ll want to find. How much can you win playing Play’n Go Wild Falls Slot? As with our other new slot reviews, we’ll look at Wild Falls in the same way. How much can you win when playing for the lowest and highest bet, that’s £0.20 and £100 a spin respectively. By using the paytable, demo play and some basic mathematics, it’s always worth looking at the prizes in comparison to the bet you make. Firstly, if playing Wild Falls for £0.20 a bet, the lowest prize on the pay table is £0.02 for 3 x 10 symbols. 4 x Q equal the bet at £0.20 while 5 x A pays out £1.20. Some of the better wins include £3.00 for 5 x mining equipment symbols whereas the Wild Falls jackpot is £5.00 if you line up 5 x bags of gold. While these wins don’t seem huge, they’ew multiplied in the number of game features. Note that gold chests will increase winnings! 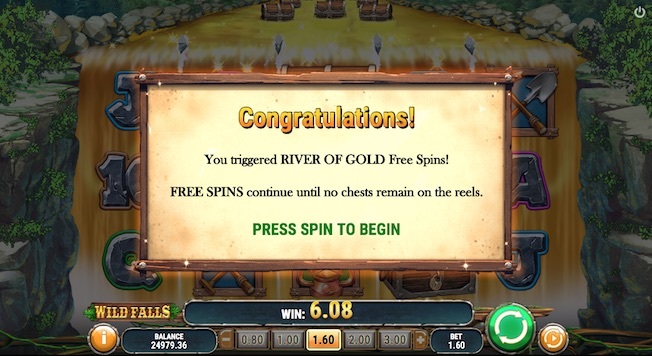 While playing at £0.20 a spin, a Wild Falls rapid re-spin returned a win of £0.50 while a River of Gold granted 16 free spins and a payout of £11,37. So there’s scope for some big wins, especially in the River of Gold Free Spins Bonus. If it goes Super, there’s no limit on what you can win. If playing the Wild Falls Slot at £100 a bet, Play’n Go prizes turn into big lumps of gold. The lowest prize in the game is now £10, 5 x K pays out £500 while 4 x pick axes offer £750. Going higher and 5 x Gold Pans will return £2000 while the jackpot is £2500 when playing loose at £100 a spin. Running the slot in free demo mode, we tested the Wild Falls slot features to see how much you can win while high-rolling. We managed to clip £95 from a rapid re-spin, below the betting price, yes, but the other bonuses made up for that. 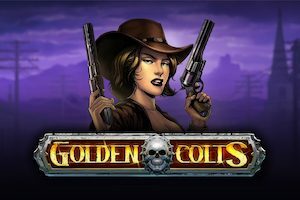 The random Gold Rush paid out £1495 thanks to multipliers while the free spins game that was triggered returned £1270 with 4 free spins. Chests – All chests are Wild and Scatters. Gold chests have 2x, 3x or 5x multipliers which combine up to 125x. Chests can stick on reels for Rapid Re-spins and land on reels 2, 3 and 4 only. The chest symbol is the main driving force behind the Play’n Go Wild Falls slot and will help create many wins. Rapid Re-spins – The Rapid Re-spins are triggered by having one or two chests on the reels. Once this happens, the chest/chests are held in place and a re-spin is awarded. What’s good about Rapid Re-spins is that they will continue with new chests added. It’s a bonus that also leads to the main winning feature, the River of Gold. River of Gold and Super River of Gold – 3 chests on the reels activate the River of Gold Free Spins Bonus. Chests can stick then walk one space down on every next spin. Free spins continue until there are no chests remain on the reels, effectively offering unlimited free spins. The big selling point with the River of Gold is that you can win up to 10,000 x your betting stake, incredible prize money. Super River of Gold is an enhanced version of the feature only its triggered during the random Gold Rush. Random Gold Rush – Is probably one of the better random extras we’ve seen while looking at new casino games of 2019. If this happens, and it happens at random, all chests turn gold with a random multiplier of 2x, 3x or 5x. Very rarely do we see online slots with random multipliers as high as 5x, and that’s why it’s a Gold Rush. Play’n Go’s gold rush game is all about getting those chests in view, without them it’s lots of banjo strings. But that said, Rapid-respins add weight to low wins and there’s always that random Gold Rush around the corner. However, if you want to get those wins flowing, you’ll need lots of luck, excellent gold panning techniques (joking) and the lucrative River of Gold Bonus. I thought Wild Falls was lots of splashing about, banjo plucking and waiting around for falling chests, but some good wins if you get them in the right place.